To finish 2007, I wanted to refer to a couple of articles published by Employee Benefits magazine that include some of my comments. "In today's knowledge-based, service economy, a substantial proportion of an organisation's value is held in its employees. Customer service levels, sales ability and intellectual assets tend to be worth more to the bottom line than the physical, non-human assets of many companies. 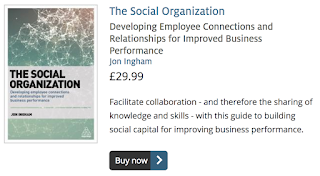 As Jon Ingham, director at human capital consultancy Strategic Dynamics, points out: "Many organisations are starting to understand that ongoing competitive advantage will depend increasingly on the quality and engagement of their people compared with competitors. So investing in human capital is partly about ensuring that the people in the organisation are fully equipped to deliver short-term business success, but secondly, it's also about having the capability to take the organisation forward and ensure that there is a basis for sustainable competition too." Ingham warns that in most organisations the costs of gathering that level of data is punitive. He recommends a more qualitative, and discursive analysis on understanding the value of human capital in the organisation: "Look at the investments that have gone into human capital, like the spend on employee benefits. [Gather information] across the boardroom or the executive team involving finance and HR and managers of the business about what the organisation is experiencing in terms of engagement; external perception; [being an] employer of choice; staff engagement survey results; and then finally place focus on the business results." Naturally, a financial director's primary attention tends to be on the harder metrics of cost control and growth, than the seemly intangible, hard-to-measure HR concerns of employee recruitment, retention and engagement. But focusing solely on what can be measured can undermine the potential to improve business performance." 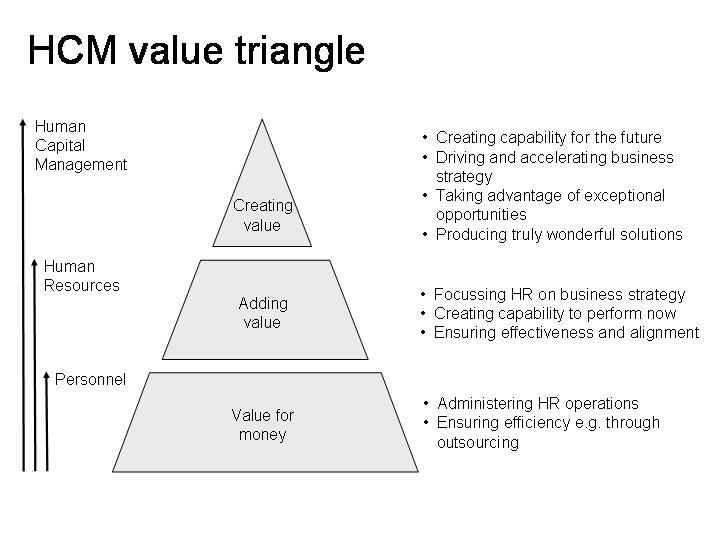 Regular readers of this blog will understand that I’m referring to the HCM value chain here. This provides a much more appropriate form of measurement than others quoted in the report. “One company that Towers Perrin worked with received £47 back for every £100 invested in pay, and £700 for every £100 invested in leadership." This is far too simplistic an analysis to provide any useful information to FDs. Calculating a financial return on investment is hard because of all the other factors in an organisation that will also inform the financial results. And it may not be the best measure anyway. ROI may be useful if a benefit is introduced simply on the basis of costs and returns. But in many cases, benefits are used to support the positioning of an organisation, helping it become an employer of choice, or just ensuring that it is offering at least the same level of benefits as its competitors. In these cases, benefits are not being introduced purely for financial reasons, and a financial ROI is not the best measure of their success. For example, in a 2006 survey, McKinsey found that the main reasons companies offered benefits to employees were: to attract and retain talent (58%), to meet responsibilities to employees (30%), the comply with Union agreements (7%), to support its corporate image (2%), to increase employee productivity (1%) and to secure tax advantages (1%). It is only the last two of the reasons that lend themselves easily to the calculation of ROI. Reward and benefits managers should also be wary of requests to prove a return on investment. In many cases, if a Chief Executive asks to see a ROI, it is simply because they do not think there is a positive return. In this situation, a manager would do better to spend their time improving the effectiveness and delivery of the benefits, rather than worrying about calculating the return. Wise organisations make investments in pay, benefits, leadership development and other areas depending upon their people management strategy and what’s required by individuals and the organisation, not by comparing returns between these different potential investments. I started posting on my beliefs about people management last month. Belief #2 is that HCM is substantially different to HRM, because of its focus on human capital, or because it accepts that, as I explained in belief #1, people are more than just cogs in the wheel. 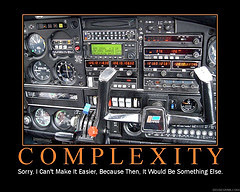 I don't think this is a particularly common view - HCM is sometimes just used to indicate a more 'modern' approach to HRM, sometime to indicate a focus on measurement, and sometimes in connection with people management technology. And it's not a very popular piece of terminology either. People object to their classification as 'human capital'. 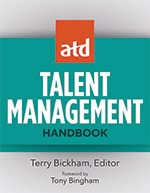 But for me, HCM isn’t the management of people AS human capital, but the management of these people FOR human capital. It’s about how organisations accumulate human capital as an intangible capability that is increasingly the most important and sustainable source of competitive success. HRM tends to treat people as resources which can be expended and used up in the pursuit of business goals. It’s a perspective that has helped make organizations much more effective and efficient, but it tends to produce compliance rather than commitment from employees. HCM recognizes that people are investors of their own human capital, and that they will only keep this capital invested if they’re well looked after and their investment produces a suitable return. HCM isn't different to HRM because of the processes it includes, but the strategic and people centred approach it brings to each of these processes. Suppose for example that you saw a really good job for one of your people advertised in the Sunday Times. Even if this job would be the perfect next role for this individual, in general, most business leaders today would ignore the fact that the job had been advertised. They might well suspect that the individual will have applied for it, but the unwritten rules in most organizations suggest that this can never be mentioned. Some business leaders would go as far as to keep the employee working over the next weekend to reduce the chance of them seeing the ad! I think in the future, business leaders are going to see the advert as an opportunity rather than a threat. They will want to talk to the employee about the advertised position and how their organization might be able to offer an equal experience. Or if their employment value proposition is strong enough, they may even encourage the employee to apply for the advertised role, knowing that they can keep in touch, and bring the employee back into their organization with even more skills and experience later on. This may seem a million miles away from how organizations work today. But I think when you’re truly focused on human capital, it becomes a very obvious step to take. And I believe it will become a common way of managing in the new S-curve. Please note however, that this is only an example. They key is to ask what potentially strange approaches may work for your organisation depend upon what the form of human capital or organisational capability will differentiate your organisation from its competitors or help to transform the level and type of services you provide. A lot of his presentation made a lot of sense to me, including that, although KeyFast also run engagement surveys, more powerful 'measurement' seems to come from face-to-face contact between managers and their staff. ‘Useful as studies are, they’re often unnecessary. You can find out much about commitment by simply observing it. When we teach classes on employer commitment, the participating executives often seek precise, rigorous, and trackable measures that they can use for management action. Then we ask those who visit multiple sites how long it takes them to discern the employee commitment level of a unit they are visiting. Without exception, they reply in terms of hours rather than days and they refer to dialogues, not data’. I particularly liked Kenny Moore’s description of the sessions he facilitates with employees and the CEO where the CEO is simply asked to listen to his staff. Now, I’m not advocating that HR abandons its ambition to become more business focused, but I would repeat my view that what separates, or at least what I believe will separate in the future, great HR from the merely good, is the function’s deep, psychological understanding of people, and how people can best be helped to work effectively in their organisations, or in Kenny Moore’s language, how the two can be connected. Global / virtual x local / personal = social? An International company clones itself around the world. A Global company forms one integrated whole and provides standardised products across the world, responding to what Theodore Levitt sees as the convergence of global tastes and values and resulting in economies of scale. Multinational companies form businesses in each different country responding to local tastes, responding to what Kenichi Ohmae sees as the need to become an insider in each market. Transnational companies seek to gain all the benefits of these different approaches: global economies of scale together with local market customisation. So for example, in forming ABB, Percy Barnevik set out to create ‘a company that is big and small, global and local, decentralised but with centralised control’. The transnational model is a later development, but is the most mature form in most business areas, and you can often see companies from the three other forms gravitating towards this one. An example is Proctor & Gamble, which for Bartlett and Ghoshal was an international company but has since moved firstly towards a global approach, cutting out the country manager’s role and handing all strategic questions about brands to new global divisions, and then towards a transnational approach, differentiating between high-income and low-income markets. In richer countries, the global business unit has main responsibility for profits and the allocation of resources; in poorer countries, which are often tougher and less familiar, it is the regions, in order to give country managers more clout over sourcing and the flow of goods, as well as over marketing. The model your business uses will have a significant impact on how global and local your HR processes need to operate, and also on how your HR function needs to be organised. However, you might need to organise policies and practices in different ways. And you may find that the strength of needs for localisation vary according to each country. This means that you might end up with varying application of global processes which is leading many transnational organisations to segment their global business into a small number of different categories. But the major problem with the model is that it doesn’t take account of globalisation and e-commerce, blurring boundaries between international and global firms. Today, companies can move directly to a virtual organisation without having to become global in a physical sense in order to maximise their global customer range and without having to diversify operations to different countries. This also helps to ensure greater consistency in service every time it is provided. The power of the Internet therefore creates a force which acts beyond globalisation. These new options can be combined with the Integration Responsiveness Framework as shown below. The e-personal model here is one which operates globally but deals with all organisational and individual customers on an individual basis. This is the area that is driven by social media and is governed by what Don Tapscott calls Wikinomics. So in my business, my website, blog and social networking give me a global footprint, and most of my work is now generated from outside the UK. But I deal with all clients on an individual basis, with an approach that is informed by, but not limited by, the country that they're from. In yesterday's virtual conference session, I was asked about which surveys supported the points I made about increasing convergence in HR. I promised I would provide some links to these on my blog. 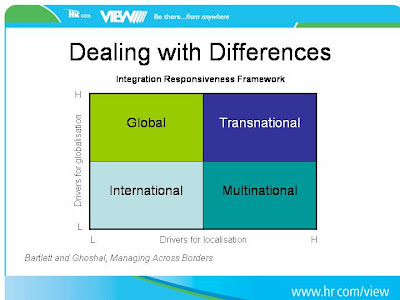 (In the session, I discussed the global trends operating across the world that may allow us to take advantage of greater standardisation in HR activities, before going on to consider some of the major cultural and environmental differences driving divergence in HR). My slide showed the top concerns of CEO’s in Europe, Asia and the US, and this came from the Conference Board. This deals with business concerns, rather than just people concerns, but I think they emphasise the consistent importance of people, as the same issues are generally shared across regions, and I, and I am sure many of my readers, would argue that people are behind success in each one of them, particularly excellence in execution. And pure people issues are also rising up the agenda (finding qualified managerial talent is #6 in Europe and #7 in the US as well as #1 in Asia). In addition, there are a number of recent surveys focusing specifically on people management which all emphasise the global importance of people, particularly leaders and talent, and that demonstrate that the war for talent has a global reach. And although it's a bit more dated (2005) than the above reports, I'd also recommend a report published by PwC on behalf of the World Federation of Personnel Management Associations, Survey of Global HR Challenges: Yesterday, today and tomorrow. HR.com's virtual conference, VIEW, is underway, with an opening, pre-recorded address from Carly Fiorina. Carly has been recounting her parents' disappointment when she dropped out of law school. I wish I'd been as brave when I was 18 to drop out of my engineering degree, and take up something I found more interesting. And when my daughters are 18, I'll celebrate if they make the same decision. I think this sort of proactiveness in shaping your career, including admitting when you've made a mistake (something I have learnt to do over the years) is one of the best indicators of potential leadership. And as Carly says, leaders are not born, but made. Anyway, I'm looking forward to the rest of the conference. I'll be attending some of the other sessions and visiting some of the exhibition stands. If you join in, check if I'm around and do say hello. And remember my session on Global Trends and Differences at 3.50 pm ET. "I was in the desert and our guide was explaining the spikes on the local cacti. 'It's so they don't get eaten,' he said. 'No, it's not,' I said. 'The spikes help keep the air around the plant still, to minimise evaporation.' Everyone thinks it's to stop animals eating them. They looked at the data and came up with the idea. And that became the received wisdom. In fact, it's the wrong idea. Many organizations believe that if they collect enough data in their computers that will set their strategy for them. In fact, unless you see the data in different ways, you will be stuck with the same old notions." The quote comes from Phil Dourado's Taking the Lead newsletter, reporting on the recent Leaders in London conference. I attended a meeting of the CIPD’s international forum last week to hear initial findings from research into HR management in global organisations conducted by Paul Sparrow at Lancaster, and Chris Brewster at Reading universities. This research will be presented in full at the WFPMA world congress to be held by the CIPD next year. The major focus of the research seems to be the complexity of decision making in the global environment. First of all, there is the well known duality of centralisation supporting economies of scale, and localisation responding to different labour markets. But regionalisation is increasingly having an effect. Then there’s outsourcing / offshoring and a wide range of technology based options. Sparrow and Brewster stress that in this environment, “even the most sophisticated organisations have difficult questions”. 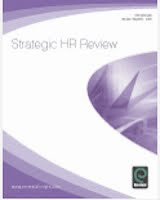 Issues these questions need to address include streamlining processes balancing standardisation and optimisation, sourcing strategies to provide HR services effectively, and the role of line managers and the HR function, particularly the business partner. But there’s also a need for what Sparrow and Brewster call “differentiated decisions” where these questions are answered on a local basis depending on each country operation’s particular business model, legislation, labour market, culture (eg preferences for in-sourcing versus outsourcing) etc. HR business partners need to be able to make local judgments to meet these particular requirements. We also need to accept that nobody can understand the whole world. Even the most internationally experienced HR practitioner isn’t going to understand all the different issues in every country so we need to be realistic about the pace that we can build the level of knowledge about countries that is increasingly required. But one way we can do this is through networks of HR practitioners, and good networks may provide more impact on the overall effectiveness of global people management than the formal organisational model that’s used within HR. So this is yet one more issue in people management that largely comes back down to the need to talk to people! I’ll be talking about some of my own perspectives on global HR at the launch of HR.com’s virtual conference programme VIEW at 8.50pm GMT / 3.50pm ET on 12th December. I would love to offer you the opportunity to participate for free. In addition, your free show admittance will enable you to see other Keynotes such as Carly Fiorina (Leadership is a Choice), Keith Ferrazzi (Never Eat Alone) and Kenny Moore (The Monk and the CEO), and Marcus Buckingham (Trombone Player Wanted). What if your competitors stole your people management strategy? In my last post, I stated that InfoHRM's capabilities, and the great case studies described at the conference illustrate beyond doubt just how powerful HCM analytics can be. 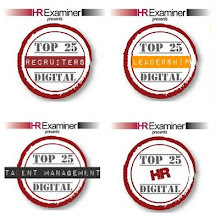 However, I still believe that a good HCM strategy has to come first. In fact, my main take-away from the conference was something said by one participant right at the end of the conference. In response to my keynote, he said he was going to go back and make his strategy more creative. He sometimes wondered, he said, whether it would matter at all, if his organisation’s competitors got their hands on his people management strategy. I thought it was a great question, and I’m a firm believer that the answer must be that it should. To drive business outcomes, people management strategies need to be differentiated and focused on the particular context of the organisation to which they apply. I’ve spent most of the last two days at InfoHRM’s European conference. It was a great event, well organised, well attended and with some great speakers. My highlights included Tony Rucci talking about his experience developing models linking people management, customer experience and financial results at Sears and elsewhere. And practical examples of organisations undertaking this journey themselves, particularly BAA and Standard Chartered. My keynote focused on the use of the value triangle and related models (which coincidentally I’ve been posting on recently to support the first of a number of posts I will be making on my key beliefs about people management). I think my session went well – I’d be interested in comments from any existing or previous readers who were there. I know I didn’t give a very strong example of actually using the HCM value matrix, and visualisation in practice. I do use these on a regular basis, but not always together. In fact most of the time I use them in the way I demonstrated, it’s as part of a programme to develop the strategic capability of HR teams. We spend a half, or even a full-day, on the content I described in my keynote, and therefore the ideas participants develop for how they can create value through human capital are generally a bit more advanced than those we came up with yesterday – partly because of having longer time, and partly because these participants all work for the same organisation, and the exercise is a little more practical and contextualised as a result. But even then, these ideas always need to be taken away for more work. And actually, the main benefit of the exercise, I believe, is having undertaken the exercise, not necessarily, the ideas that result. My aim isn’t so much about participants going away with a new idea which is going to guarantee an organisation’s success for the next 10 years, it’s about them developing a mindset that I would like to hope everyone who experiences the exercise, takes away and applies to everything they do in people management for the rest of their career. And it doesn’t really matter whether they ever come up with something that creates value. It’s about continually pushing activities up the value triangle as far as they will go. Continually asking, ‘how can I add and create more value through this?’. I also hope that I didn’t depart too far from the conference’s clear focus on HCM analytics. As long as you promise not to tell anyone, dear reader, I will admit that in my blog posts, I do sometimes over-state my criticism of those who I feel sometimes over-exaggerate the role of measurement and analytics in HCM. InfoHRM’s capabilities, and the great case studies described at the conference illustrate beyond doubt just how powerful HCM analytics can be. HR practitioners often talk about the need to think about and present their work as business solutions rather than HR solutions. A lot of the time, I think what they're actually talking about is 'adding value' solutions rather than 'value for money' solutions (in the value triangle). And I'd agree with this need to increase value. But of course, most value comes from the creating value level. Through human capital and organisational capability. 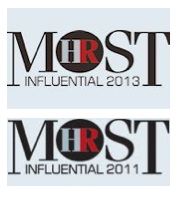 So we do need to steer away from delivering HR or really Personnel or value for money solutions. But it when we're delivering human capital solutions that we're going to have real impact and gain credibility as a strategic function in our own right. But this is going to require a change in mindset after years of getting closer and closer to the business. Yes, of course, we still need to do this, but we need to develop a greater understanding of how to leverage human capital too. Another way to look at the primacy of people management is through the concept of organisational capability. The slide suggests that intensified competition; growing access to financial capital; and work that is ever more knowledge based, have all led to new opportunities for a company to increase its competitiveness. Organisations in the private and voluntary sectors can translate this into transforming the type and level of services that they provide. This is not just about doing things more effectively or efficiently, but doing better things. 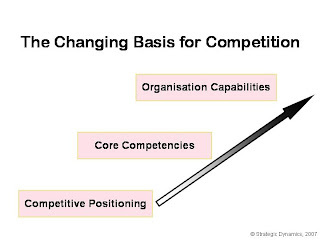 Most business leaders are comfortable with the concepts of competitive strategy and competitive positioning: particularly Harvard professor, Michael Porter’s ideas around differentiation, cost leadership and focus. Within this paradigm (shown at the bottom of the slide), people management is a secondary activity and the HR function, as we all know, is often left in a bit of a strategic backwater. I believe that the opportunity for HR to increase its contribution started to emerge in the early 1990s with the realisation that an organisation could leverage its own resources or core competencies to provide itself with a competitive advantage. Core competencies are partly built upon people’s skills and abilities (which does give HR some leverage), but they tend to focus even more on particular business processes, technology and customer loyalty. So, for example, the originators of this concept, Hamel and Prahalad identify 3M’s core competencies as specialist expertise in substrates, coatings and adhesives, not as the ability of its people to innovate new products within these areas. So core competencies provide HR with a more central role, but it is still easy to see other functions as more important. The concept of organisational capability (shows at the top of this slide) builds on the idea of core competency by recognising that it is people and the way they are managed and developed that are an organisation’s most important source of competitive advantage. 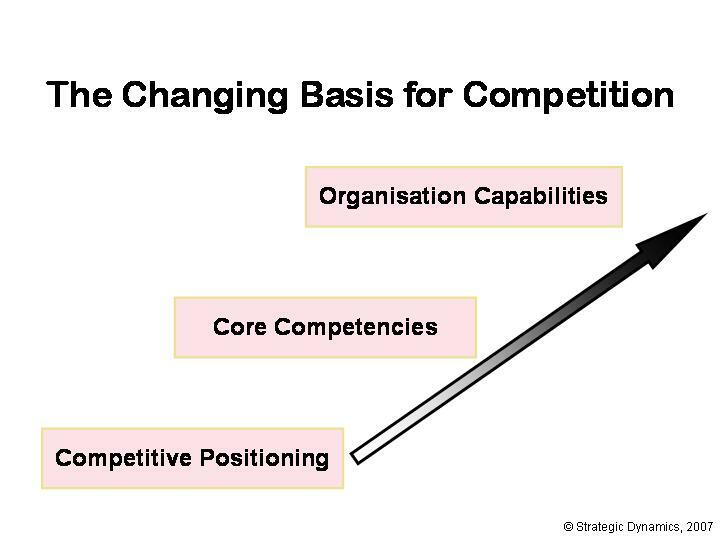 Out of these three approaches to competition, I think there is a growing belief that the further along this arrow, the higher up the slide, the more sustainable the approach becomes. There’s just too much change these days for competitive advantage from external positioning to be anything other than elusive and fleeting. Organisation capability / human capital / people provide the basis for ongoing strategic success, not just the implementation of current strategy. 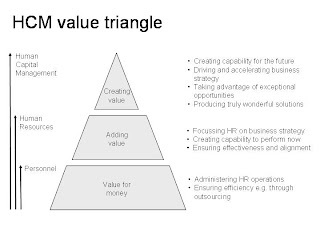 At the base of the triangle, HR provides value for money when it increases the efficiency of HR activities. This may not improve customer satisfaction or help deliver business results, but it is still useful value to have. An example would be improving a recruitment process by automating relationships between suppliers, HR and line management to reduce the time to fill vacant positions. The next level is adding value. This is about helping the business to implement its strategies by translating business objectives into people management activities. Another recruitment example at this level might be helping a business achieve its growth objectives by launching a campaign to fill a number of new positions. And then creating value. Here, HR generates value for the business through its own activity, rather than by how its activities support the business as a whole. So, adding value at level 2 provides an organisation with the ability to implement business objectives. Creating value at level 3 develops new capability that enables the organisation to set different or more stretching business goals. A recruitment example would be developing an employer brand to position an organisation as an employer of choice, and by doing so, significantly increasing its potential to grow. Creating, rather than simply, adding value through people informs the organisation’s business objectives, it doesn’t just help the organisation to meet them. So the importance of people is much greater than thinking about their role purely in terms of implementation would suggest.